Non-medicinal ingredients: EDTA, rosemary extract. 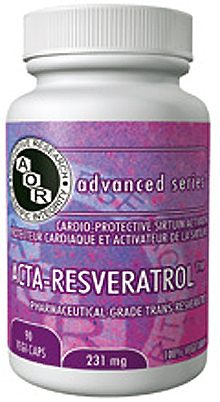 Resveratrol is a polyphenolic compound found in various berries (cranberry, blueberry, grapes) and herbs. Studies with trans-resveratrol have reported a diverse range of benefits in areas of heart health, immunity and inflammation. Research has also revealed that trans-resveratrol mimics the biological longevity effects of a calorie-restricted diet. It is an antioxidant compound that is a phytoestrogen, or plant estrogen, which is protective of hormone-mediated cells in the body. Resveratrol is a potent antioxidant if stabilized. If not stable, it may quickly metabolize out of the body. This compound is believed responsible for some of the beneficial effects of moderate red wine drinking on the cardiovascular system. Resveratrol is also considered to be beneficial to smokers’ lung tissue if it is stabilized to last long enough in the system to be transported there. Resveratrol is also an inhibitor of the COX-2 inflammatory enzyme and encourages cell death (apoptosis) of abnormally growing cells. Resveratrol is a difficult substance to stabilize. Because of the difference between resveratrol produced in the oxygen-poor environment in red wine and the form of resveratrol in unstabilized supplements, it has long been thought that resveratrol supplements were not very effective in comparison with wine. Knowing the importance of how a resveratrol supplement is metabolized, Now’s scientific staff has recently developed a special technique of stabilizing this compound in order to have an antioxidant effect closer to drinking a good glass of wine. While both trans and cis forms of resveratrol are naturally occurring, most of the recorded health benefits are attributed to the trans form. Oligomeric proanthocyanidins (OPC) are a group of flavinoids that have powerful antioxidant potential. Antioxidants protect cells from oxidative damage by neutralizing free radicals. Free radicals are unstable molecules that in their bid to become more stable must bump into healthy cells and cause damage. They are produced in the body as a byproduct of normal metabolism or can come from pollutants, UV radiation, infections and the liver’s processing of toxins. Antioxidants are nutrients that help to protect your body from the damage caused by free radicals - the toxic molecules that play a role in the development of diseases from cataracts to heart disease, from arthritis to cancer. While our bodies produce some of these free radicals as the "garbage" from some its natural processes, we are now exposed to more and more of them from our environment than ever before. The chemical pollution of our air and water now leave us exposed to very powerful free radicals that we have never been exposed to in the past. In combination with the nutrient depletion of our foods from modern chemical agriculture, we now also get less of the important nutrients from it that would normally help our immune systems fight these chemical invaders. This is why many nutritional doctors recommend their patients take supplements of antioxidants. When a free radical enters your body, it is attracted to the cells that make up the different tissues of it just like a magnet to metal. It then bonds to parts of the cell, which causes it to deteriorate in a way similar to that which oxygen causes metal to rust. If the cell gets damaged enough, it dies. Worse yet, if the cell DNA is damaged and then the cell reproduces, it reproduces abnormally as a result. When this happens to our skin, we get wrinkles; when it happens to our oxygen carrying blood vessels, we get hardening of the arteries; when it happens to our joints, we get arthritis; in some people - if it happens enough - they may even get cancer. Antioxidants work by bonding with the free radical before it can bond to the cells of your body, thus neutralizing it. This now harmless substance is then deconstructed or merely excreted. Take three capsules daily with food or as directed by a qualified health practitioner.